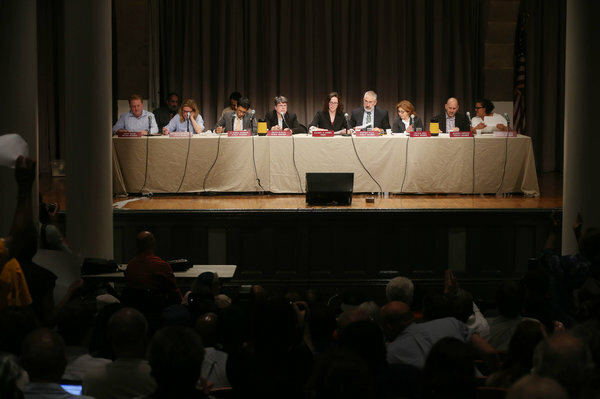 The board that regulates rents for more than one million rent-stabilized apartments in New York City voted on Monday night for a freeze on one-year leases, an unprecedented move in its 46-year history. The board, one of the few tools the mayor has to directly influence the cost of housing in the city, also voted to increase rents on two-year leases by 2 percent, a historic low. The mayor refrained from publicly calling for a rent freeze as he had done last year. But his housing plan aims at building new affordable housing while staving off the loss of existing affordable units — either through rent increases or the removal of stabilized apartments from regulation. The crowd at the Great Hall at Cooper Union for the Advancement of Science and Art in Manhattan erupted in loud cheers and chanting. 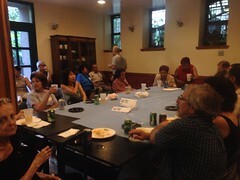 Many tenants and their advocates were thrilled, even though they had earlier said they hoped for rent reductions. Rent board members said the data this year warranted relief for tenants. The two dissenting votes were cast by the two landlord representatives, J. Scott Walsh and Sara Williams Willard. She called the approved proposal “myopic and biased” before casting her vote. Research by the board staff showed that landlords’ operating incomes after expenses had grown for nine consecutive years, most recently by 3.4 percent. Their operating costs grew by only 0.5 percent because of significantly lower fuel costs, the staff said. Stabilized renters, meanwhile, experienced stagnant incomes and higher housing costs, the research showed. The vote was a welcome turn of events for tenants after they failed to persuade Gov. Andrew M. Cuomo, a Democrat, and Albany legislators to strengthen the state law that governs rent-regulated apartments in the renters’ favor when it was renewed last week for four years. “Cuomo betrayed us, the R.G.B. can save us,” tenants chanted before the vote. In extending the rent law, though, the State Legislature increased the monthly rent threshold at which an apartment can be deregulated to $2,700, from $2,500, and established that the threshold will be adjusted upward according to any increases passed by the Rent Guidelines Boardstarting next year. Some tenant advocates say that the provision means that the only way to get a sizable rise in the threshold for vacancy deregulation is to increase rents. Last year the board resisted the mayor’s call for no rent increases despite already having a majority appointed by him. Instead, the board passed the lowest percentage increases since it was established in 1969 — up to 1 percent for one-year leases and 2.75 percent for leases of two years. The rent changes apply to leases starting Oct. 1 and are in effect until Sept. 30 of the following year. About 60 percent of all rent stabilized units are affected by each year’s vote because not all tenants renew their leases every year, largely because they are in the second year of two-year leases. The mayor’s office estimated that number at 630,000 apartments housing more than 1.2 million tenants. One of these tenants, Soledad Franco, 53, said that half of her income goes to pay her $1,122 monthly rent and utilities for a four-bedroom apartment in the Bronx she shares with her mother, three adult children and a grandson. “This will help me a lot,” said Ms. Franco, an account manager at a shredding company.